I have this dream, when it comes to tiny house living, about being in a community of other tiny house dwellers. There's this concept called cohousing that was invented and developed by the Danish that I came up with before I heard about it. I don't say that to brag, thinking I did something, or thought of something before someone else or whatever, but to show that this is where my dream of community led me on my own, only to find my idea validated when I heard of cohousing. The concept behind cohousing is more than just an "intentional community", but a community where the residents are the developer. Cohousing is started when a group of people with similar values for living, though not necessarily the same religious or political views, come together to create a true community. To me, this means a place where children can run around, trusting whatever adults are nearby, where people come across each other on pathways and stop to chat and have a beer or soda together, where people eat together on a regular basis, talking and laughing together. To me, a cohousing community is about sharing: cooking together, eating together, doing repairs and landscaping and gardening together. All cohousing developments have a common house and common areas that are cared for by the people who live there. Shared meals are common, nightly in many of the communities. There's a book called Creating Cohousing: Building Sustainable Communities by Kathryn McCamant and I'm in the middle of reading it now. I can't recommend it enough to people who are even remotely interested in this kind of community. The idea is to create true community, rather than just a bunch of houses that are near each other. I found it at my library on Overdrive (which, if you've never used it, is GENIUS). There's also a book on Senior Cohousing, but as that does not yet apply to me, it's not high on my reading list. Standard cohousing (all ages) is really good for the older generation, in my opinion, simply because being shipped off to be around no one but old people can be depressing, and seniors really need a younger generation to whom to tell their stories. Plus, being around seniors is good for kids and the younger generation because it introduces a new perspective. So how does this apply to what I want to do? Well, in a dream world, where land in Los Angeles isn't prohibitively expensive, or I had won $140 million in a power ball jackpot, I would jump on this in two seconds flat. I might be willing to develop it on my own, just because I am so gung-ho on it all, but I need other people. Just because I am in love with the idea, doesn't mean everyone will want a yoga room on the premises. Basically, this is my idea: 30-40 tiny houses in community around a larger community center/ communal house. Because most tiny houses aren't built for true plumbing (composting toilets, gray water catchment, etc. ), all that plumbing would be in the central house, including showers and (probably) flush toilets. I still want the showers and sinks to go to a central grey water catchment holding tank for use on the garden, rather than all draining out to sewage lines. In that building would also be a community kitchen, larger than what's in most houses even, so we can cook for 20-30 people every night. I want a cafe atmosphere with wireless internet for everyone who works from "home", complete with cushy chairs and desk-like work stations. We'll probably end up with an espresso machine, too. I'd love to see a pillow room or play room of some kind for the kids in the community, and a yoga/meditation room for the adults. I'd like to see a walk-in fridge and/or freezer that can be shared by the community because many tiny house have very tiny fridges. I'd like to see a solar array on the roof to power the whole building, and any outbuildings. The only outbuilding I'd like to see is a workshop where people can build their houses on site if they don't have one before they join in, or simply to make repairs or do craft projects. This could also be the garden shop as well: a place to start seedlings, replant larger things, as well as storing garden tools. My biggest dream, the thing I'd like to see more than just about anything else, is a large community vegetable garden. With all the grey water that we'll be producing (20-30 houses, plus community showers and laundry), it should be more than enough to water vegetables and some fruit trees. I'm obsessed with the idea of keeping an organic garden, even though I know almost nothing about it, and would love to keep that in mind. We'll also need a compost heap, and a place to take care of the composting toilets. If we do it right, it shouldn't stink at all, which is good. I still need to get a copy of the Humanure Handbook, but since I can't get it at the library, I'm going to have to buy a copy, and I don't have the money for it yet. Yet. I'd also like to do a couple rental units, both ones that will just be available month-to-month and ones that we can list on AirBnB, or use for guests of residents. I have a vision for the community, now all I need is about 15-20 other tiny house-ers to join in to this craziness. People who will help me plan, help me pay for things, but most of all who will be an extended family in this tiny life. I have to say that I do a TON of research on a regular basis for tiny house stuff. I'm subscribed to at LEAST four different email newsletters, I read various blogs, and I'm constantly looking at videos on YouTube. Even my mom has gotten into the research portion of this adventure, now that she finally realizes that I'm serious about wanting to do this. As I get closer and closer to making this dream a reality, I have to pare down and simplify what this project is going to mean to me. What do I need to actually live in a tiny space? My mom wants me to make sure that I design it to be big enough for two people, and since she's going to be helping me pay for it, I have to curtail my impulse to make it extra tiny. She's probably right. Not only do I eventually want to get married, I do plan on having kids one day. So I'm making a wish list. 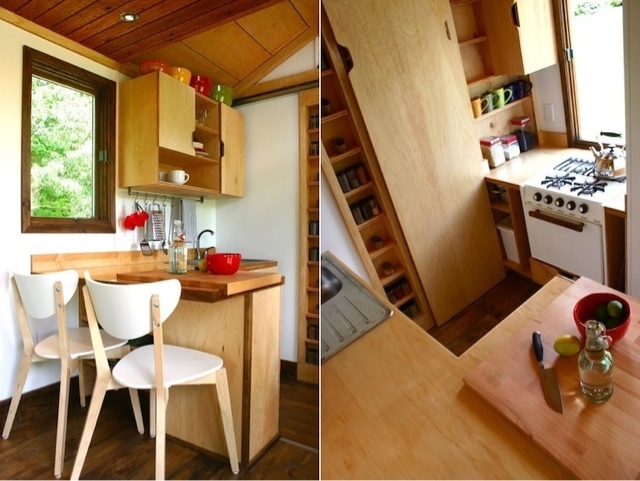 So many tiny houses do the same thing with a living/lounge area on one end, and the kitchen bathroom on the other end, with a loft above. That layout works fine for some people, but I don't like the side by side kitchen bathroom under the loft layout. I know the TMTH they're next to each other, but the same direction as the trailer, if that makes sense. I don't like the idea that I can't have someone tall in my kitchen cooking with me (it's that mystery husband talking here- he's gotta be taller than me, and I'm already 5'9"), or doing dishes after dinner. One of the things I love about the TMTH is that the kitchen feels very open. It's got a huge (for a tiny house) picture window above the stove, a storage loft above the bathroom, and another window above the island area. It feels very light and airy to me. My mom is demanding that I get a full size fridge, rather than the college dorm room-sized one in the pictures, and I'm inclined to agree. My issue with that idea is that I picture a full-sized fridge as being one of the massive sub-zero things that would take up half of the floor plan, when in reality, it only means a separate fridge/freezer in one unit. There's one I found on Home Depot's website that's about 10 cubic feet and probably perfect for my use. Honestly, the way I cook and eat, I need more freezer space than fridge space. I think I'd almost rather try and do two units under counter, a separate fridge and freezer side by side, but getting two appliances rather than just one might break the budget a bit. Plus, it's less energy efficient, and will likely leave me less storage in my kitchen. I love the pantry in the TMTH, how it hides behind the bathroom door when it's open, and is visible when you close it. With the full size fridge, I could probably put in a small cabinet between it and the wall for pantry space. There was a unit I saw a while ago that had a genius feature: the loft was built out of metal, steel, I think, and was magnetic, so the owner was able to put his spices etc on the bottom of the loft, rather than having to find cabinet space for them. It was pure genius, and I'd love to figure out something like that. Granted, I don't want to put the loft above the kitchen, but I'm sure we could do some kind of metal backsplash that would have the same effect. Magnets are my friend. Also, mason jars hanging from the bottom of cabinets. In the TMTH, they built a closet around the toilet, which is cool, but considering how small that space is, having to separate the shower from the rest of the room just eats up space. I'd like to do it as a wet-room, with a single drain in the middle of the floor, rather than trying to keep the water contained to a tiny stall. This will also make it easier to shave my legs. Did I mention I was tall? I could use the space around the toilet as typical bathroom storage with a mirror above the toilet for doing makeup. My mom sent me a video of the hOMe, and while there's a lot of little details I like, overall, I think they waste a lot of space (gigantic self-contained composting toilet? Uncomfortable looking couch?). But she particularly pointed out the roof line. In the TMTH, it's a gabled roof for most of it, and then a shed roof over the loft area. I'd like to do a shed roof on the whole thing, and then flattening out slightly. I'm going to be living in Los Angeles at the end of the day, so rain will be the least of my worries. And I HAVE to have a skylight that opens. Since I plan on doing solar panels, I'll need to be able to get out on the roof to clean them (dust is a problem), and the window will allow me to vent and air out the unit when it gets crazy hot in the summers. I'd also like storage stairs. This one may actually be a pipe dream, because stairs take up a LOT of space. The problem is that my mom is right, I am a bit of a clothes horse (just don't tell her I admitted to it). I love buying new clothes, and I hate getting rid of things because you never know what you're going to need to a costume or a role. And things always come back into style eventually. The point is that I need storage. In the hOMe, they had chest of drawers acting as a wall, which I think is a great idea. With a floating loft in the center, as opposed to only above the kitchen, I could put a second set of drawers on the opposite side of the bed for that future husband of mine, but I still need hanging space. I have a lot of dresses and skirts that I don't think should be folded, so that's where the stairs come in. I could do a mini-hallway between the kitchen and bathroom with a closet on either side. 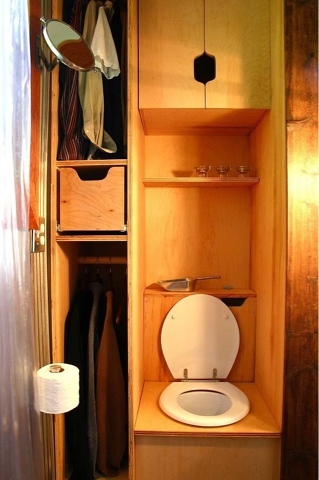 This would give me a tiny bit of clothes storage, as well as a place to put a broom. It's this and my mom's demands that are pushing to a 24-foot trailer rather than the 20-foot that the TMTH is built on. She wants me to do a 28-foot trailer, but that's too big. At least for me. So this is my wish list. So far. I'm sure there's more stuff that needs to go on my list, so hit me up in the comments with your ideas. The title should come with a bit of a disclaimer. I am not yet an actual, official, registered architect. In fact, I'm not even out of school yet. 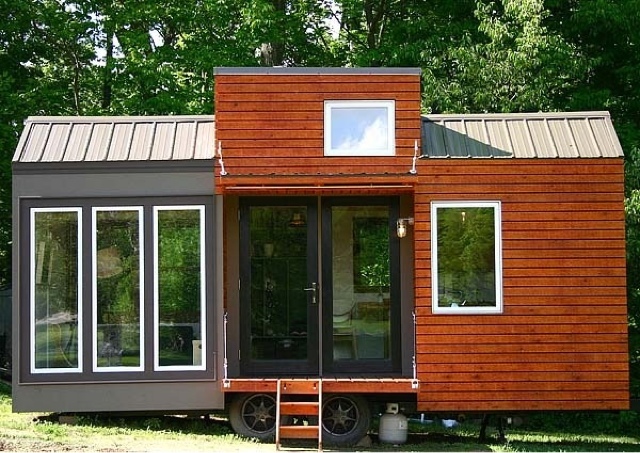 I am, however, incredibly fascinated with the idea of designing a small dwelling place. I was properly inspired by the lovely Sarah Susanka, architect and author of nine best-selling books, and the originator of the "Not So Big" philosophy of residential architecture which aims to built better, not bigger. At least, that's what wikipedia tells me. Hey, and check this out. Someone apparently was inspired...that's 80 square feet right there. Crazy right? Anyway...in light of all of this, when Deb came up with this harebrained scheme to convert a bus into a home...well, I had to hop on board. So, here I am, ready to give my two-cents and my design expertise...ahem...err...one school year short of true expertise. What about me can I share with you? I'm 22 and I love Jesus. I've got family back in Texas (and Texas will always be the home to my heart) but currently residing in California suits me pretty stinking well, I must say. I'd like to describe myself as artsy fartsy because I think it's a silly term and it makes me laugh. But seriously, I think I would do better telling you what I'm not interested in than trying to share what does interest me. But I'll try anyway: architecture (obviously), fashion, art, books and writing, music, crafting, and drinking coffee....yea, especially that last one. What does that mean I can bring to the team? Um...well, I'll always make sure that these other two lovely ladies have plenty of coffee to keep them alert and focused and on task. :) And if that doesn't pay the bills, I don't know what does.